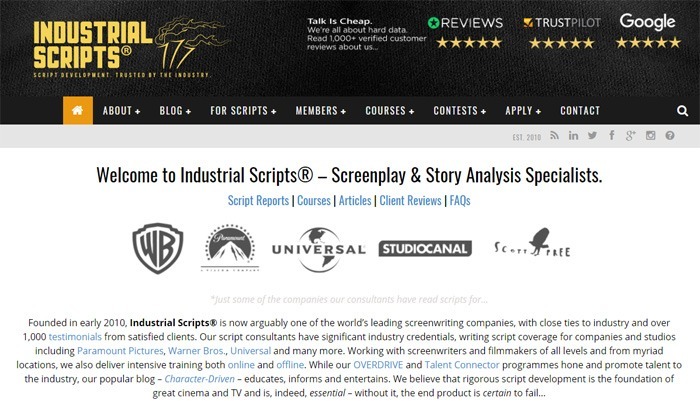 Can You Really Make Money Writing For Industrial Scripts? I found this website on a list of websites that will supposedly pay for freelance writing. But can you really make money writing for Industrial Scripts? At first, this website is a little bit confusing, because the URL for it is screenplayscripts.com… yet the website itself is called Industrial Scripts. But right on the landing page, they give a little ‘about us’ blurb that actually helps to explain exactly what the site is all about. The Basics: What Is Industrial Scripts? The owner of the website, Evan Leighton-Davis, was apparently previously employed by companies such as Warner Bros, Universal, Paramount, BBC Films, and Ealing Studios. He was, among other things, a full-time industry script consultant, and analyzed material for a wide range of producers in Hollywood. This website actually offers a lot more than you realize at first glance. In fact, it took me a while to figure out exactly what it is that they do… but after some reading and researching, I was able to put together a list of the primary functions that this website seemed to serve. So what does all of this mean for us? What can this site do for us? So the idea behind researching websites like this is that websites that hire freelancers can be awesome for writers hoping to build a freelancing side-hustle. I am actually a writer myself, and have been spending more and more time looking into sites like this because they offer the opportunity to earn a bit of extra income on the side. But unlike taking surveys or signing up for shopping/cash back apps, freelance writing gigs actually pay decent money. Yes, you can earn extra cash with survey apps, but to be super honest, taking surveys is not a skill-based job… so naturally, more people are going to have access to it, which means that the demand for survey-takers is not nearly as high as the demand for writers. Since fewer people have actual marketable skills as a freelance writer, and since the need for this kind of work is actually really high, you can generally bank some pretty decent extra cash doing it. There are, however, a few things to keep in mind. First of all, just finding a website that hires freelancers is not enough. Once you find a site like that, you also need to pitch to them and get your pitch accepted. Then, you need to make it through editing and revisions before you can ever hope to get it published… and in turn, get paid for it. Second, you need to keep in mind that rejections and failures do happen in this industry. Just because you write something, even if it is pretty good, does not mean that you are going to end up selling it. Sometimes, pitches get turned down. And sometimes, even if your piece is well-done, it just isn’t what the editors are looking for. And in those cases, you may need to pitch it to a different site and start all over on the site you had in mind with a different piece. So you have to stay committed and determined to build up a portfolio and enough experience to make it in this industry. That is a challenge, but it is definitely not impossible! Does this site really offer writers the ability to get in on the ‘writing’ portion of the site? Obviously this site caters to writers in terms of classes and reviews… but can freelancers pitch to it to try to earn a bit of extra cash? To find this out, we went to the ‘Apply’ tab, and scrolled down to the ‘Write (Paid)’ section… and found this. Here are the facts that we learned while looking through this page. As far as payments are concerned, there are basically two tiers. There is a tier where you get paid $40 for a 1,000+ word article, or $70 or a 2,000+ word article. But one really cool thing about this site is that the income is reliable. In other words, if you get selected, and as long as you ‘keep up the good work,’ they say that they keep writers busy and that you can absolutely count on the paying work on a regular basis… which means a lot! This website is actually so attracted to the idea of keeping their writers long-term that they pay every four articles. It really seems that once they find good writers, they like to keep them—so that is pretty awesome! Plus, you get to write about movies. And that is actually really cool! 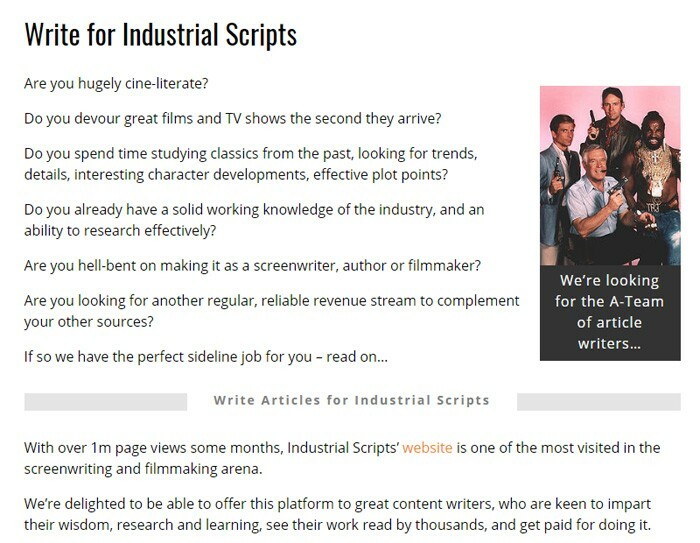 If you love movies, love to write, and don’t mind putting your best foot forward to try to earn a writer’s spot in a more prestigious publication, then Industrial Scripts may be a good website for you to pitch to. But keep in mind that websites like this are not interested in hiring one-off writers… so if you don’t intend to keep up the good work and keep delivering content, this may not be the site for you. This may also not be the site for you if you are not really interested in movies or storytelling. Personally, I really liked Industrial Scripts. They publish some really awesome content. If you spend just a little bit of time reading through their articles, you will see that they seem to be drawn to writers with passion—and in the end, that is what it is all about. That is what they are looking for, and that is what they want. Are you passionate about film, screenwriting, storytelling, and/or movies? If so, then this may be a great opportunity for you. As far as the payouts go, they pay out pretty well. I have actually seen some sites that pay out more, but the great thing about Industrial Scripts is that they are pretty committed to keeping the same writer… so once you get in, as long as you keep up the good work, you can count on consistent work on a monthly basis, which is super-awesome. So yeah. You may not get rich writing for this site, but it seems to be a pretty good opportunity for someone interested in movies and film to make money writing about what they love! Should you try to write for them to make some extra money?